A couple of weeks ago, Graph of the Week published an article describing the significant improvement in medals won by the host country as opposed to how that country 'normally' performs when not hosting. We concluded that Great Britain (the host country) would end up with between 53 and 70 medals (roughly 1.5 - 2.0 times more than 'normal'). As it turns out, they won 65. The Winter Olympics may not be until 2014, but why not make another prediction for the host country? So, Russia, let's take a look at you and see what we can surmise. Fact: Russia has never hosted the Winter Olympics - nor had the Soviet Union. That seems a bit odd seeing that the Russians usually do well in these games. There is probably another story lurking around there, but we'll let someone else field that one. Just like the Summer Olympics, the Winter Olympics also spur athletes on to perform better than ever. Rather than jumping, throwing and running, however, these games feature skiing, skating, sledding and of course, hockey. The graph above clearly shows this effect from all modern-era Winter Olympics. "When Coubertin revived the Olympic Games, only summer sports were included. In the 1920’s, however, snow and ice sports began to enjoy soaring popularity. A number of IOC members decided to react to this new phenomenon. In 1924, it was decided to hold an International Winter Sports Week in Chamonix (France): 258 athletes from 16 countries (mainly in Europe and North America) attended. The week was a great success and, two years later, it was retroactively named the first Olympic Winter Games. The future of an Olympic event dedicated exclusively to snow and ice sports was assured." Just like the Summer Olympics, the Winter Olympics have also had their share of scandals, controversies and boycotts which affect the results (and any statistics derived from those results). "A significant advantage for home teams was observed across all conditions (Mp = .604); and time era, season length, game type, and sport moderated the effect." 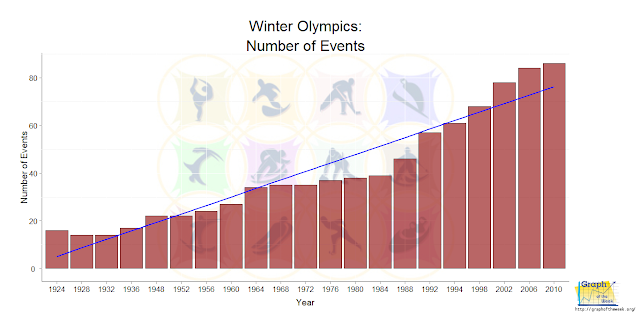 While the number of total events in the Winter Olympics is small when compared to the Summer Olympics, this number has risen steadily over the years. Looking at the graph below, a rather sharp increase in the number of events starts in 1992, continuing through 2010. Back in 1924, there were only 16 events, but that number will rise to 98 for the 2014 games. And like their summer counterpart, this provides more opportunity for the local fans to show up and cheer on their athletes, providing a mental edge in all events for the host country. But, like the summer games, it's difficult for any country to be proficient in every event. This is especially true for countries with financial difficulties or environments not conducive to Olympic sport (although that doesn't stop the Jamaicans!). So, while there are more opportunities to have the home court advantage, there are also more opportunities for other countries to win. 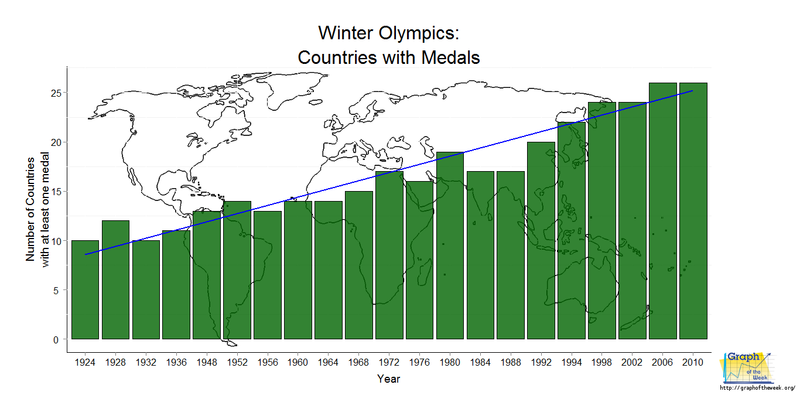 Not as many countries participate in the Winter Olympics when compared to the Summer Olympics. In fact, 28 countries (out of 80) won medals in 2010 (compared to 79 countries (out of 204) winning medals in the 2012 Summer Olympics). That being said, the number of countries which win medals has steadily increased from 10 to the aforementioned 28 as shown in the chart below. Since more countries are producing Olympic-level athletes, it follows that the host country's medal count would be reduced due to the stiffer competition. While that was true for the Summer Olympics, it isn't very true for the Winter Olympics. In the first half of the modern Winter Olympic era (through 1968), the host country winning percentage was about 10%. During the second half (since 1972), that percentage only dropped to 9% (for comparison purposes, these percentages were 24% and 9%, respectively, for the Summer Olympics). So, while the smaller countries are winning more medals, they aren't doing so at a rate that significantly affects the host country's winning percentage. 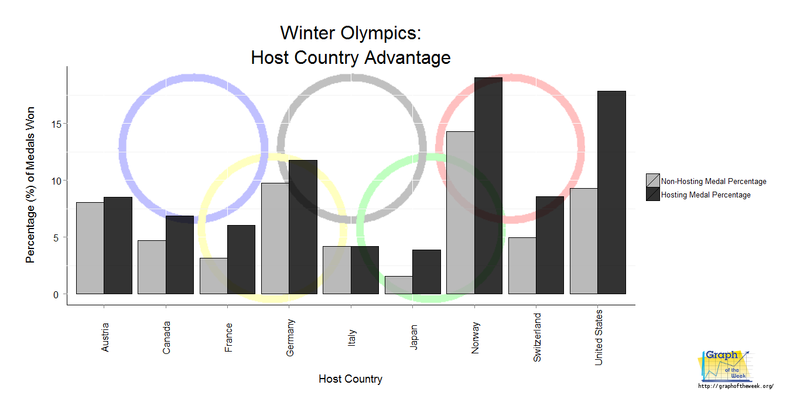 Is the Host-Country Advantage as Strong in the Winter Olympics? In our previous article about the Summer Olympics, we estimated that the host country advantage for those games was between 1.5 and 2 times better than what we considered 'normal' (using the last three Olympics to determine 'normal'). Does that hold true for the Winter Olympics? No, not to that degree. This median winning percentage of all host countries - when hosting - is approximated at 7.7%. For these same countries, that drops to 5.0% when not hosting (for the Summer Olympics that is 8.5% and 3.4%, respectively). When attempting to predict how many medals Russia will win using this method, we take 7.7% of the estimated 294 medals awarded (usually more due to ties) which will net them 23 medals. So, the host country advantage for Russia, using the above method, is only 1 percentage point higher (they would get 23 medals instead of 20 for 2014). That doesn't seem like much of an advantage. We suspect that they will obtain more than 23 medals. Or perhaps the host country advantage isn't as great for the 'big dogs' in the Olympics - those that finish with high medal counts every year. If we multiply the expected amount (when not hosting) by 1.5 as pointed out by Stephen Clarke for the Summer Olympics, Russia would end up with about 30 medals for 2014. "For the time being our recommendation is: do not bet that Russia will win 24 medals at Sochi Winter Olympics! But, if Russia makes it with more than 27 medals you would be allowed to conclude that she performed very well, better than expected with an economic model, and that this must be due to exceptional efforts of Russian athletes and coaches before and during Sochi Games. If Russia would win less than 21 medals, you could join Prime Minister Putin and President Medvedev in complaining that the Russian winter sports squad should really have done better – or that it was unexpectedly bad lucky." As concluded in our Summer Olympics article, there are many attempts to quantify home-court advantage. The best ones will give a range of performance rather than a specific number due to the large amount of variables involved. And as the Andreffs point out above, do not bet that Russia will win 24 medals on the nose. Rather, enjoy watching the Olympics for what they represent. Of course, it is fun to play around with predictions, so Graph of the Week will use a combination of the above efforts and estimate that Russia will win between 24 and 31 medals. This is a bit higher than most predictions, but then again Russia has never had the home country advantage in the Winter Olympics. We suspect they will rise to the challenge with a chance to grab even more. 1) Why has Russia (or the Soviet Union) never hosted the Winter Olympics in the past? 2) Will future warfare and politics affect the Olympic games as in the past? 3) Will Russia's performance decline in 2018?